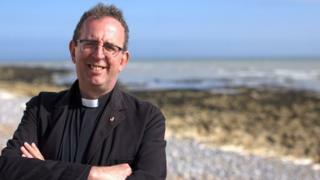 Pop star-turned-vicar the Reverend Richard Coles has credited a mental health hospital for saving his life when he was 17. The former Communards keyboard player said he was an inpatient at St Andrew's Healthcare in Northampton when he had an episode of clinical depression. Mr Coles said he was coming to terms with his sexuality and "as a gay man in Kettering in 1978" at the time. The care he received "literally saved my life", he said. The former Strictly Come Dancing celebrity contestant said: "There really wasn't much sense of a life rich in possibilities. "It was a much less tolerant world then than it is today and that was a real struggle. Coming here (St Andrew's) made a big difference to me." Mr Coles, a broadcaster on BBC Radio 4's Saturday Live programme, visited St Andrew's Healthcare as part of LGBT (Lesbian, Gay, Bisexual and Transgender) History Month. He said the care he received from two psychiatrists there helped put a stop to "all that internalised self-loathing" and gave him a sense that "this is an identity that's not necessarily a negative identity". "I became determined, I wasn't going to live the narrow, mean and constrained life that was the best on offer. "And I ran away to London and formed a new life and became an activist," he said. Through access to media and music he said he "caught that rising tide of change". Mr Coles was ordained into the Anglican priesthood in 2005 and is the vicar of Finedon in Northamptonshire.